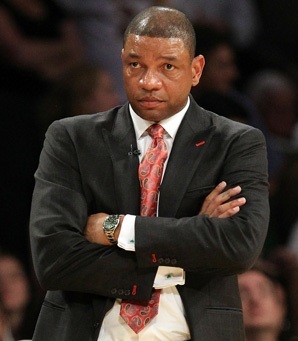 Home » Hoops » Are the LA Clippers Legitimate Title Contenders With Doc Rivers as Head Coach? Are the LA Clippers Legitimate Title Contenders With Doc Rivers as Head Coach? More than a week of speculation finally concluded earlier this week when it was reported that a deal to send Boston Celtics head coach Doc Rivers to the Los Angeles Clippers had been finalized. The Celtics received the Clippers’ first round pick in 2015 as compensation. A lot of the media focus has been on the impact of losing Rivers and his legacy in Boston. However, the inevitable questions will soon start to be asked. Most obviously, does Rivers make really transform the Clippers into a legitimate contender? LA’s second team has had one focus for this offseason and one focus only. They need to re-sign Chris Paul. The remarkable trade that secured Paul propelled the Clippers into real legitimacy for the first time since the franchise moved to LA in the mid-1980s. Paul is widely regarded as one of the very best point guards in the NBA. He has tremendous leadership quality and if signed to a long-term maximum deal, could make the LA Clippers into a big money organization. However, after being beaten up and knocked out in the first round of the 2013 playoffs by the Memphis Grizzlies, there have been some doubts about whether Paul would re-sign with the Clippers. In particular, many speculated about a possible big free agent pairing of Paul and Dwight Howard elsewhere. The Clippers believe that bringing in Doc Rivers as head coach will ensure that Paul signs a new deal on July 12th. Rivers is easily one of the most highly respected head coaches in the NBA today. He is passionate, earns the love of his players, is a great seller and can be the face of an organization as he clearly proved with the Celtics. Still, if Paul does re-sign, will the Clippers really be legitimate title contenders? Certainly many of the problems identified with this LA team have been mental and in terms of the toughness mentally and physically required to be successful in the NBA playoffs. Rivers cannot transform DeAndre Jordan and Blake Griffin into better all-round players. He cannot prevent the seemingly inevitable departure of Eric Bledsoe, who is almost the certainly the best back-up point guard in the NBA. It also now looks like a possible Kevin Garnett trade, who would be a superb addition to this roster both in terms of his leadership and skill set, will be blocked by NBA commissioner David Stern. The league forbids player-coach trade swaps and Stern has strongly suggested that the two trades are ‘clearly’ linked. This is still a team that needs more balance, needs better defense and probably even still needs more scoring. The Western conference isn’t getting any easier with rising teams like Golden State and Houston, the Lakers will surely be re-tooled in some way by the time October arrives, and San Antonio and Oklahoma City will be strong once again. Rivers and Paul have a tough task ahead of them.